The breaking of a three-year-old Asian elephant calf. WE WON!!! Ringling Bros. Circus Closes in May, 2017!!! Although Ringling Bros. and Barnum & Bailey Circus has closed, we still leave up the information below about our efforts to bring that about. Other circuses continue which also abuse their animals and, especially, torture their elephants. All animal circuses should be ended. Circus abuse of elephants is largely hidden behind the Big Top. Our circus campaigns seek to educate the public about this hidden abuse with the hope that an enlightened and compassionate public will no longer tolerate it. My name is Anthony Marr. Even though I'm Canadian living in Vancouver, I'm compelled to write you this media release because I am deeply moved by something momentous soon to occur in Denver, even before it has occurred, and by the amazing Denver woman who will make it happen. Her name is Kristal Parks. She will undertake a water only hunger strike - in a cage with chains - from the time the Ringling Bros. Circus comes into town until the end of its last performance (12 days). 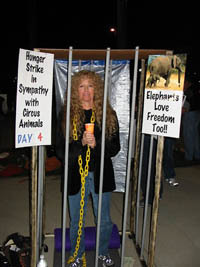 The hunger strike tells of food-deprivation as a training tool, and the cage says volumes about the wild animals' confinement, elephants and tigers alike. The chains are a testimony to the suffering of elephants who are chained much of he time. If Ms. Parks wanted to draw further parallels she would also have to be beaten with a bull hook every so often and poked with and electric cattle prod but even Ms. Parks has her limits! She will be present at each of the 19 performances. Many people find it hard to believe that elephants are really tortured by circus trainers, buy why would anyone voluntarily go days without food just to tell a lie? What Ms. Parks is saying is the truth. Circus animals suffer greatly in order to entertain spectators. Ringling Bros. & Barnum and Bailey circus is "THE SADDES SHOW ON EARTH". as her banner will say. It seems to me that elephant abuse is so sickening that as long as it happens in her city, Ms. Parks can not eat.In her own words, "Elephants cannot speak for themselves. So we must be their voice in as clear and uncompromising fashion as possible. Circuses today are the modern gladiator sport: (hidden) blood and guts for our entertainment. If children knew how the animals were treated, they would not want to go to the circus". We, the undersigned, form a group of elephant researchers working together to study elephants and promote their conservation and welfare. Our combined experience represents over 200 years of work with free-ranging, wild African elephants. We are the acknowledged experts in the field. It is our considered opinion that elephants should not be used in circuses. Elephants in the wild roam over large areas and move considerable distances each day. They are intelligent, highly social animals with a complex system of communication. No captive situation can provide elephants with the space they need for movement or with the kind of social stimulation and complexity that they would experience in the wild. To watch an elephant family in the wild is a glorious experience. Led by the oldest female--the matriarch--the family is bonded by kinship, affiliation, experience, great loyalty and affection. 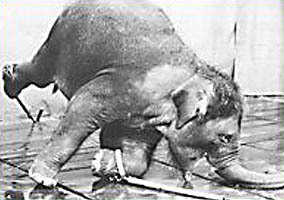 Elephants in circuses are confined and chained for hours, are bought and sold, separated from companions, and frequently moved about. In short, they are treated as objects of entertainment for humans. 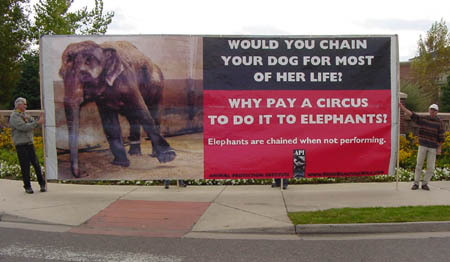 This billboard sized banner was generously donated, along with leaflets and signs, by the former Animal Protection Institute.